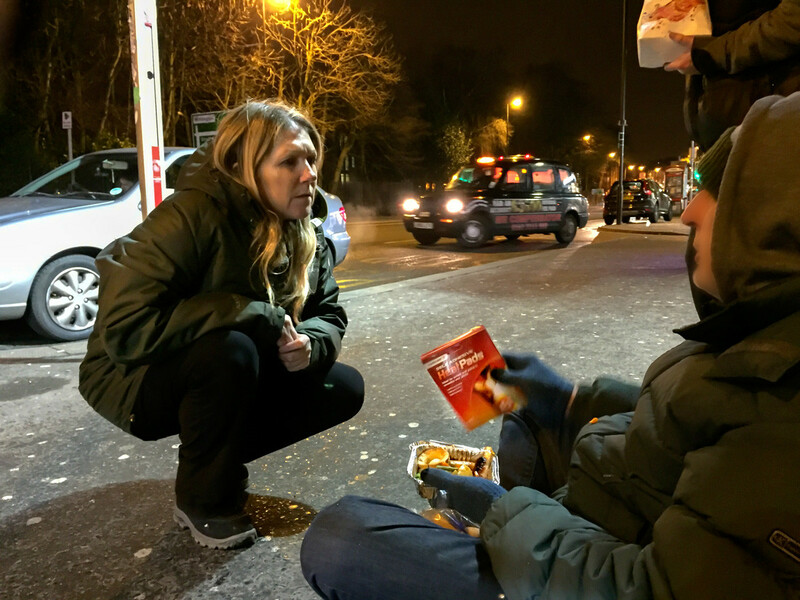 As I pulled up in Chorlton to meet Julie and Jim, who volunteer for Mad Dogs to deliver hot food to the homeless, the temperature reading on my dashboard was 3.5 degrees. The previous day it had snowed, leaving the streets wet and chilled, as if a fridge had leaked onto them. I stepped out of my warm car and into Jim’s old Citroen. Julie and I have started to affectionately refer to it as his clown car as bits keep falling off, But it goes, and Jim willingly shares it with us and those that we serve. In fact, I think Julie, who works at The Christie, and Jim maybe two of the kindest people I’ve ever met. 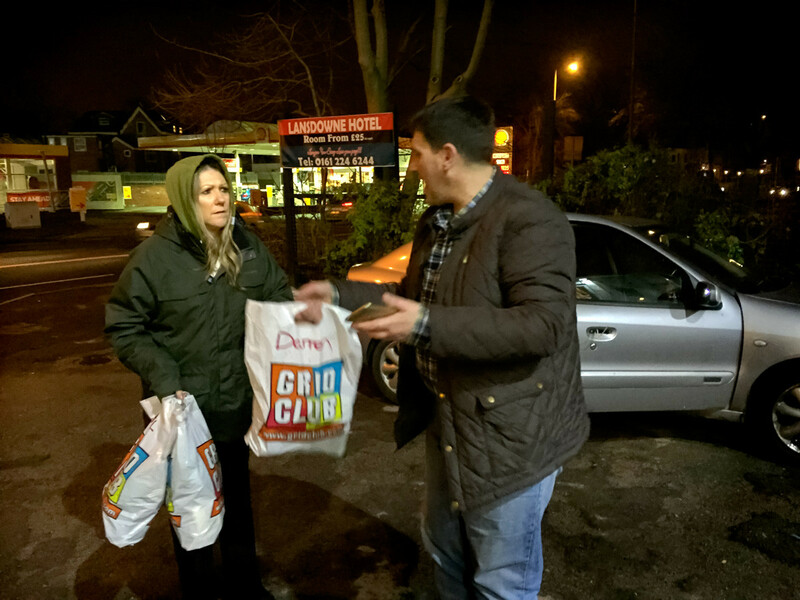 We start by collecting the meals from tonight’s cook, Gemma, who lives nearby. She’s cooked thirty-five roast dinners which are neatly packed into take-away cartons, and then into a polystyrene box to try and keep the food warm for as long as possible. 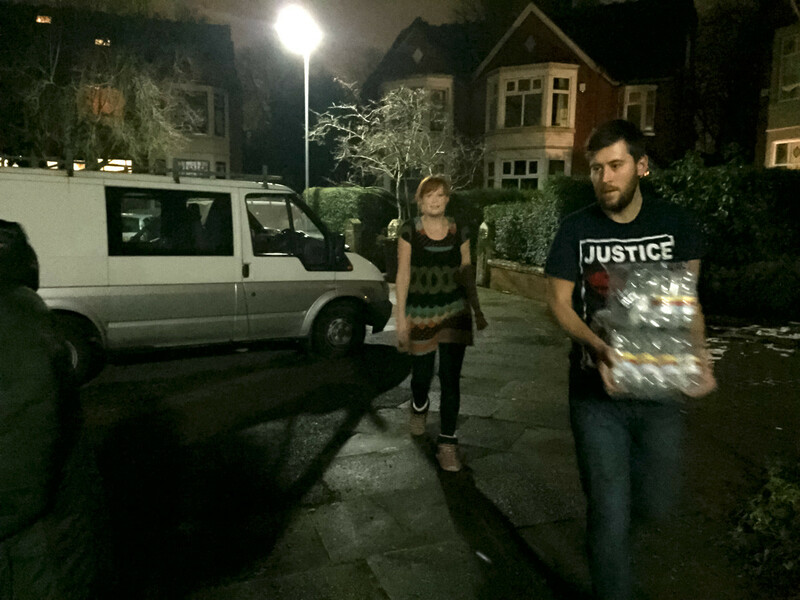 We also have bottles of water, clothes and a large flask to make tea, coffee or hot chocolate. As we say our thanks to Gemma and her partner, breath puffs from our mouths into the dank night like we’re steam engines leaving a station. We follow a set route. From Chorlton we head to Withington, then down through Fallowfield and into town along Oxford Road, and then Deansgate. With 35 portions we used to make it as far as Porltand Street, and even into the Northern Quarter but, since Christmas, we now run out not long after we’ve reached the top of Quay Street. We could have 50 helpings with us and it wouldn’t be enough. We pull up outside an estate agent’s in Fallowfield where, ironically, we find Rob, his legs bundled into a thin sleeping bag. After we’ve given him his food he thanks us and reaches out to shake our hands. His touch is as cold as the dead. Julie gives him a heat pad, normally used to cure aches and pains but which tonight will keep him alive. She buys about 20 of them each week from Poundland, and wonders when the manager will ask her if she’s got her own market stall. 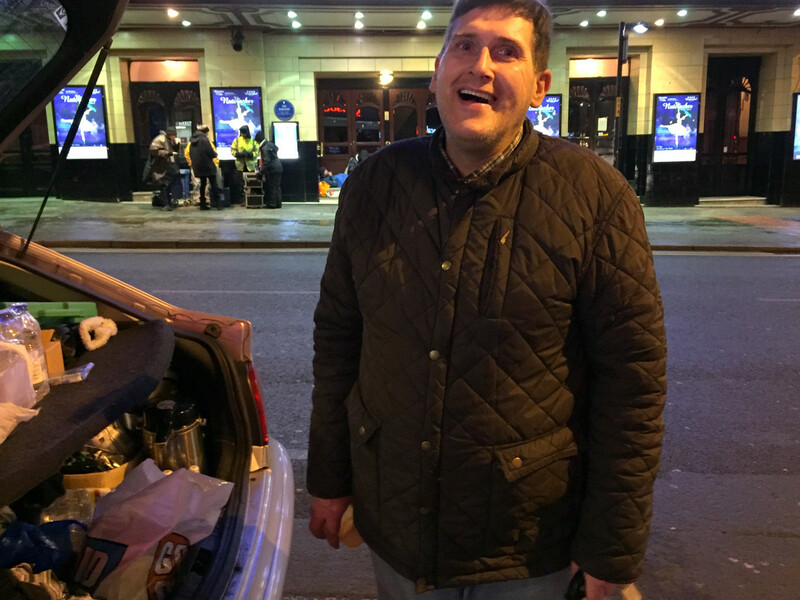 Further down Oxford Road, just past the university, we see Peter, a large man perhaps in his late fifties. He is articulate, and talks in a deep voice, perfect for broadcasting on Radio 4. His thick fingers are swollen with the cold and, unlike most weeks when he loves to chat, this evening he simply wants to eat and try to stay as warm as he can in the doorway that he’s found. “I was once so cold, I was driven mad by it” Jim tells me later. “I was banging my head against the bricks, so I was.” We all wonder how Peter left the warmth of Australia, where he had a job, and ended up sleeping on the frozen streets. We’ll ask him next week. 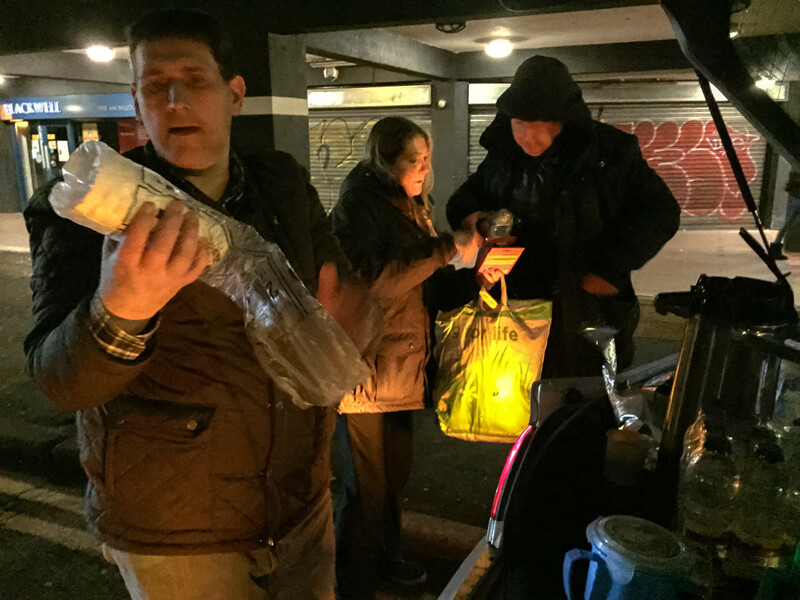 We continue into town and feed several people in the bit between the old Cornerhouse and the McDonalds at Portland Street. 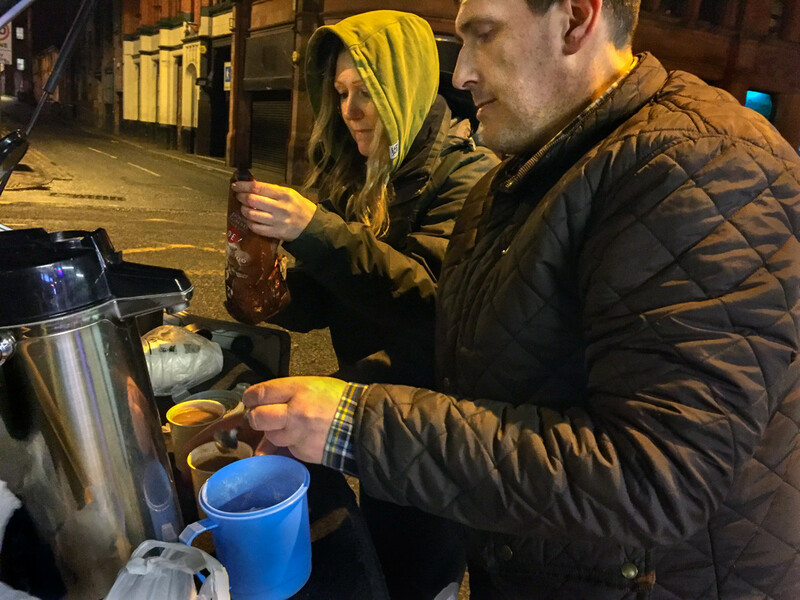 On the corner of Whitworth Street West, as we prepare the hot drinks ( hot chocolate, with three sugars, is the most popular option from Cafe Jim ), the cold cuts into us. One man, shivering and hopping from toe to toe, says to us that without people doing what we’re doing he’d be dead. It’s a an awful thought. Not long later, we’ve already given everything out, even the vegetarian option. We’re seeing more young people on the streets tonight too. 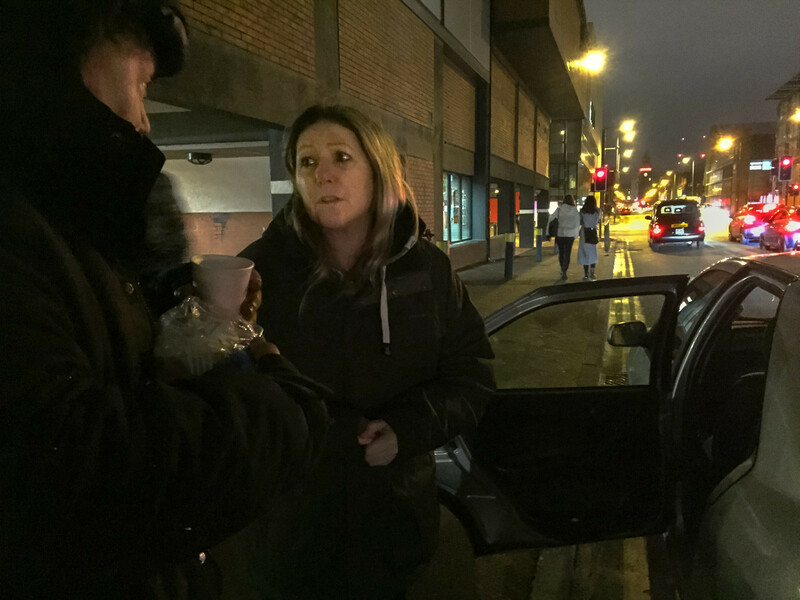 The conversation on the drive home is about how the system consistently fails those in need. Everyone has a timeline and who are we to judge? 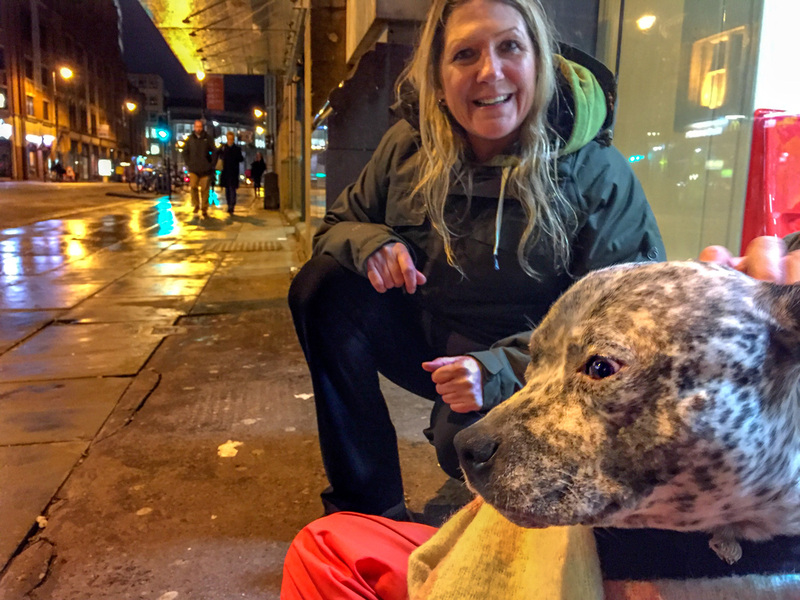 It’s very difficult to accept that sometimes the homeless are actually pissed on, and what little they have is either stolen or messed up in some act of evil bravado. We chat about me doing this feature and wonder whether we’ll come across as “lefty do gooders”. I’ve never understood why being a “do gooder” is an insult. I stop at a chippy and order comfort food. Chips, peas and gravy, my choice. I sat in my heated car to eat it, and savoured every moment of my good fortune. 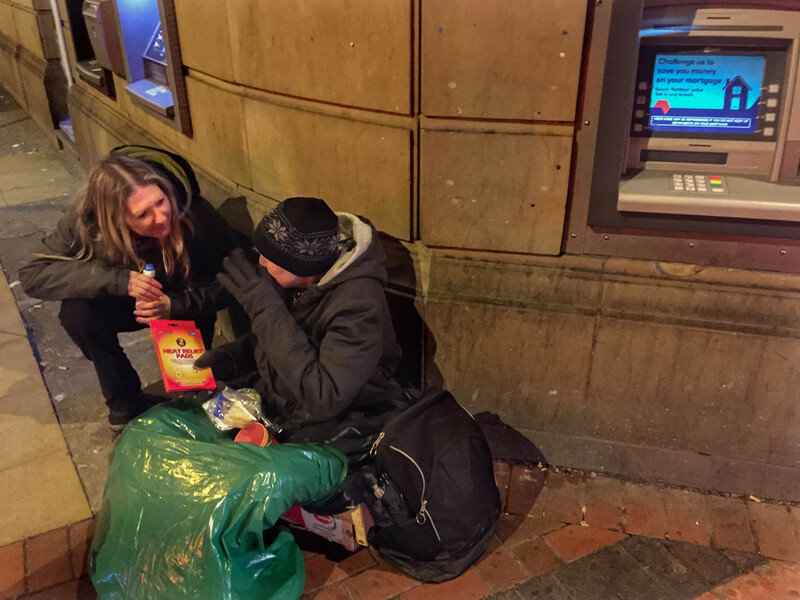 The people living on the streets need all the help you can give.